ALL MEMBERS... Be automatically entered for a chance to WIN A TRUCK with Rick Hendrick Chevrolet, a NEW 50" 4K Smart TV and other great prizes ALL NIGHT LONG!! What if you could have 5 minutes of uninterrupted time with some of the HBA's top builders where you could show your product and answer any questions they may have? What if you could have 5 minutes with 20 builders in one evening? That's what CHBA Builder Speed Networking can do for you! Each Associate gets a table and two chairs. Bring your materials, business cards, displays, etc. and set up for the best sales opportunity you've ever had. 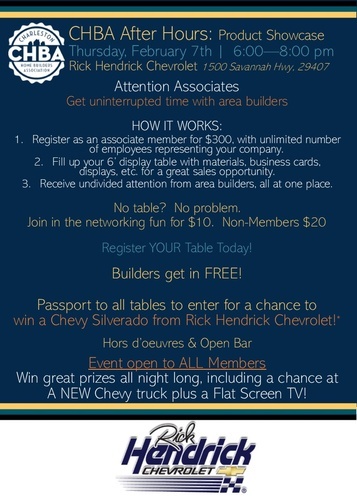 Starting at 6:00 PM, get time with the CHBA's top builders. Space is limited to 20 businesses. Cost to attend as an individual Associate Member- $10. Non-members- $20. Small bites and open bar!